Share the post "Rutgers Plant Breeder Elwin Orton Inducted into NJ Inventors Hall of Fame"
Elwin Orton with Venus dogwood tree. Photo Credit: Wolfgang Eberts. Elwin Orton, professor emeritus of plant biology and pathology at Rutgers, was inducted into the New Jersey Inventors Hall of Fame. Orton, who was among four Rutgers faculty members to be honored during the annual awards dinner on Oct. 18, was credited with “saving the U.S. dogwood industry” with new varieties of hardy, disease- and pest-resistant hybrid dogwoods when diseases and insects threatened the native species of the popular flowering tree. Orton is described as a “legendary plant breeder” in the current issue of American Gardener, the American Horticultural Society’s magazine. He’s received many awards over the years, including two major awards from the American Horticultural Society and the Distinguished Service Medal from the Garden Club of America. Orton was inducted into the New Jersey Nursery and Landscape Association’s Hall of Fame and received the Norman J. Coleman Award of the American Association of Nurserymen. And just last week the Eastern Region of the International Plant Propagator’s Association initiated a new Research Fund in honor of Orton. 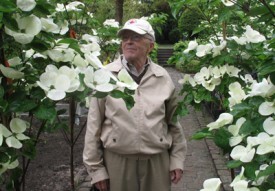 Orton has earned more than 15 patents, with more pending, for new cultivars of dogwoods and holly that he developed over his more than four-decade career at Rutgers. The university estimates that the retail value of his creations is greater than $200 million and licensing royalty proceeds to Rutgers exceed $1.9 million. A resident of Millstone, NJ, Orton earned a bachelor’s in horticulture from Penn State in 1952 and a master’s in horticulture from Ohio State in 1954. Shortly after earning a doctorate in plant genetics from the University of Wisconsin in 1960, Orton joined Rutgers. He was promoted to professor in 1973 and became a Professor Emeritus in 2008. Read more on the Rutgers dogwood breeding program.